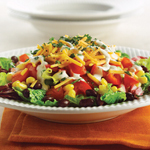 Flaunt the natural succulence of corn in a crisp salad, like this Southwestern Ranch Salad. Nothing compares to the taste of produce eaten in its prime. Enhance the flavor of fresh fruit and veggies with Kraft Salad Dressings, made with real ingredients.